Today I went to the Louvre and one of the things I was anxious to see (other than The Mona Lisa) were the paintings by Johannes Vermeer,after all Girl With a Pearl Earring was a book club favorite. Although the two Vermeer paintings I saw were not amongst those mentioned in the book Girl With a Pearl Earring, it was a thrill to see them in person. I was pleasantly surprised to see how much I knew about Vermeer and his camera obscura just from reading Tracy Chevalier’s book. 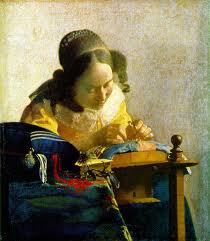 I couldn’t help but remember how Vermeer posed Griet or arranged the props on the table as he prepared to paint.Vermeer’s painting The Lacemaker was just beautiful!